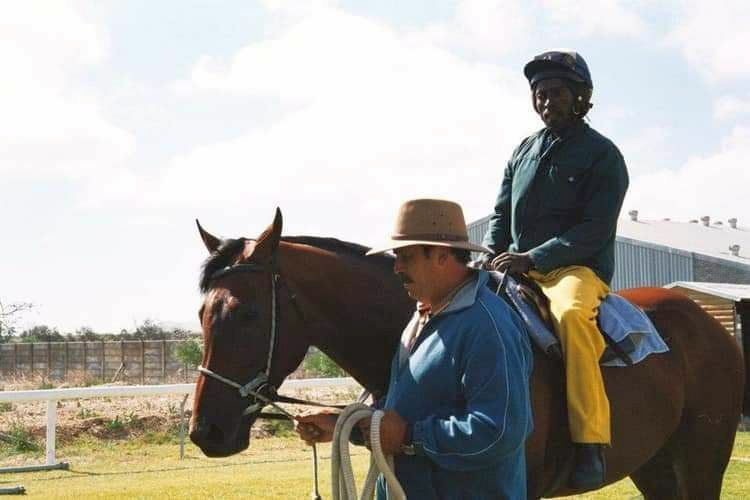 “Sparrow was my top work rider, he rode Dynasty in morning gallops when Karl Neisius wasn’t available. essential to calm him down. handicappers and jumpers, so he decided to take a chance and called me in to work with Dynasty. The racing industry was hesitant to use my services. First of all I wasn’t really proven with horses at high level, secondly I came from a background in the church,” hejokes. days and he was very good at what he did. We had to start away from the stalls doing the ground control, as we call it. That was teaching Dynasty to trust us, slowly at first, following our instructions, moving to certain gestures and so on. a bond with him, he gave us his assistance. At the stalls, he became a handful, he was really difficult, he was prone to kicking out wildly. “We persisted and the trust between us grew stronger. After a while Gavin would lead Dynasty into the gates and I would be pushing on his flanks. We got him into the right frame, that is a frame of mind in which he started to trust us fully when he saw us, and obeyed our instructions. “With Dynasty the most important thing was to ground him, to calm him down as he reached the stalls area and then to lead him towards it. nearly four lengths, everyone was pleased. even for Maiden Plates because my being there helps the horse to remember the work he has done. an Instamatic Camera, but it is special because this was my acid test. A truly memorable day with Anchen and Bon Ami!